At Harlan, Slocum & Quillen we are committed to three guiding principles: customized service, convenience and compassion. No one wants to file bankruptcy or face the overwhelming burden of a financial crisis. But, when you are ready we can help! Harlan, Slocum & Quillen, located in Columbia, Tenn., has been specializing in consumer bankruptcy law and advocacy exclusively for more than 25 years. We pride ourselves on not being like other law firms. Our clients are not just another case number. We take the time to listen to your concerns, because each clients' situation is unique. Whether you are at risk of foreclosure or are ready to initiate filing a Chapter 7 or Chapter 13 bankruptcy, or simply seeking advice, at Harlan, Slocum & Quillen you can partner with a board certified consumer bankruptcy specialist a leading-edge professional in the bankruptcy field. We know how stressful the worry and fear of overwhelming debt can be for you and your family. Let us help. The law office of Harlan, Slocum & Quillen, located in Columbia, Tennessee, is committed to the exceptional representation of individuals and families involved in financial crisis, such as Chapter 7 or Chapter 13 bankruptcy. Our firm has been representing individuals and commercial clients in bankruptcy cases, for more than 20 years. We specialize in in offering our clients high quality representation for Chapter 7 bankruptcy or a Chapter 13 bankruptcy, depending on their specific needs. As part of our services we help clients with foreclosures. If your house is at risk of foreclosure or is currently being foreclosed on, take immediate action. You may still have time to save your home. It is important that action take place to stop the foreclosure before the advertised sale date. Our clients can expect to be welcomed by a caring and professional staff ready to listen to your needs and expectations. Our goal is to provide you with the specific service you need -- foreclosure prevention, chapter 7 or 13 bankruptcy, mortgage advocacy, an end to harassing calls from debt collectors or, simply, advice. Most importantly we want to help you find a solution to your financial concerns. Born in 1957 in Columbia, Tenn., Bob Harlan was raised on his family's farm in Hampshire, Tennessee in western Maury County. 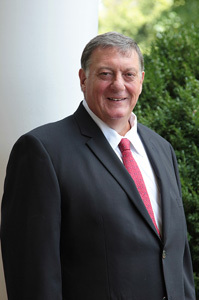 Harlan worked in the family businesses learning the ins and outs of the agricultural industry until he graduated high school and attended college at the University of Tennessee in Knoxville. Growing up on a working farm, Harlan has knows and understands, first-hand, the value of hard work and the importance of careful financial management. Today, Harlan still lives and works on his family's farm where he operates a cattle-farming operation in addition to his full time law practice. This appreciation and respect for land and a rural way of life affords Harlan a special understanding of the unique needs of clients in the southern middle Tennessee region that he serves. A Tennessee resident his entire life, Keith Slocum attended Middle Tennessee State University, in Murfreesboro, Tenn. graduating in 1998. He graduated from Nashville School of Law with his Juris Doctorate in 2003. While attending law school, Slocum served as a paralegal for Rothschild and Associates, establishing his legal knowledge in bankruptcy early in his career. Slocum handles both consumer Chapter 7 and Chapter 13 bankruptcy cases, business Chapter 7 and small business Chapter 13 bankruptcy cases. He also specializes in mortgage litigation that relates to bankruptcy. Motivated by the sincerely belief that his assistance helps make a meaningful and positive impact on his clients' lives, Slocum has sought advanced training and education in the area of bankruptcy law and mortgage litigation. Today, Slocum is a subject-matter expert on mortgage advocacy and advises clients and colleagues on the complex field of mortgage litigation.